Caritas Internationalis President Cardinal Oscar Rodriguez Maradiaga says civilians in Gaza face a humanitarian crisis if Israeli military action is not halted by the international community. He says there is an urgent need for aid agencies to reach the sick and wounded in Gaza, including women and children.Caritas says it’s unsafe for people to move around in Gaza, meaning doctors are unable to reach clinics or the injured in their homes, and no aid distributions can take place. Caritas Internationalis, the confederation of 162 national Catholic charities, provides primary medical services in Gaza through Caritas Jerusalem and the local parish church. A Caritas medical centre and a series of medical points remain operational though with difficulties, while the mobile clinic is grounded. Cardinal Rodriguez said, “Caritas and our Catholic Church partners in the Holy Land call for an immediate ceasefire to enable the sick and wounded to be treated. 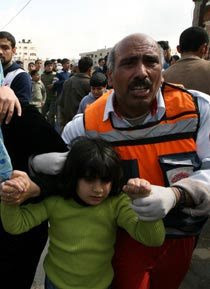 Innocent people are suffering because aid agencies cannot reach them due to the Israeli military action. The latest figures show 87 Palestinian children have been killed in the Israeli attacks. Caritas is calling for an immediate end both to Hamas rocket attacks into southern Israel and Israeli bombardments of Gaza to enable humanitarian relief supplies to get through. Caritas Jerusalem Secretary-General Claudette Habesch said, “Our staff in Gaza are witnessing a collapse of medical services. People are dying in their homes because they can’t get treatment. There are 2,053 hospitals beds in Gaza and 2,500 people wounded by the Israeli bombardment. Doctors say they lack bandages and antiseptic.” This crisis follows an 18-month long Israeli blockade of Gaza. There is a lack of food, medicine and other aid items in Gaza.